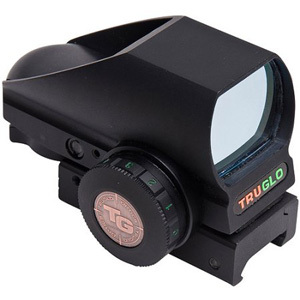 A real budget price of below $75 might raise a few eyebrows as far as this particular Truglo Red-Dot sight goes, so hopefully this Truglo Red Dot review will help address all concerns that might arise as a result of budget sights generally viewed with a lot of caution. In many instances, the extent to which you might be cautious reveals itself to be a bit of an over-compensation, but since there are red dot sights that cost in excess of $500, you are well within your rights to want to find out as much about this sub-$80 sight as you can, before possibly buying. The very first question that comes to mind regarding this red dot sight is perhaps what can I use it for? If you want an easy-to-use, convenient red-dot sight for quick target acquisition, the Truglo Red-Dot Tru-Brite Open-Dot Multi Blk Box is definitely worth checking out, even if you are a serious shooter. In essence, general, all-round shooting is what this sight is earmarked for, but there are naturally some limitations. One such limitation is the sight’s inability to handle the recoil caliber of guns such as the AK-47, which in fairness would be pushing the sight way beyond its indicative limits. On the side of the target, the coating has been given some anti-light-reflection properties, which kind of raises questions as to why the entire scope’s coating wasn’t made anti-reflective. That said, however, the reflective part isn’t all that reflective and you’d have to look very closely, knowing exactly what you’re looking for if you were to make the sight out from whatever gun hand-piece it would be mounted on. Weighing a tiny 5.4 ounces, this is definitely the lightest scope we’ve ever come across and its compact, featherweight design doesn’t seem to take anything away from its firmness and rigidity. Since it’s earmarked for serious shooters, this should attest to its durability, but that durability remains to be tested. It’s definitely worth taking a chance on however because you likely won’t pay more than $75 for the sight. Depending on where and when you buy it, this scope’s price range is very similar to that of the Bushnell Trophy Red Dot Sight featured in our TRS-25 review, so it’s worth having a look and perhaps comparing some key features you’re particularly looking for. 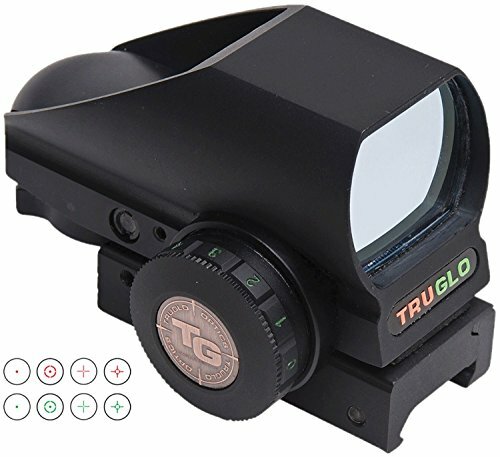 What’s the catch since this Truglo seems to be quite durable, even for a true budget sight? Again, you’d be stretching its capabilities a bit too far if you attempted to use the Truglo Tru-Brite with a gun with the sort of caliber of say an AK. It stays latched on to the AK with no problems at all (doesn’t come apart or come loose), but it’s durability in that regard is irrelevant because the zero doesn’t even put up a fight to stick. On something like an AR 10.5 pistol, however, the Truglo Tru-Brite comes into its own perfectly, but you’ll probably have to co-witness it with an A2 or similar peep sight. The lightness has to be mentioned again and you might find yourself wondering whether you’ve actually added a sight to your firearm or not — it’s THAT light! The batteries are not expensive at all and it has a great range of reticles to choose from, which means that you can even use it for hunting, in addition to general purpose use. You’ll get a wide field-of-view and this is where you might come to realize why the anti-reflective properties are limited to the target’s side — it makes very clever use of natural lighting to control the sight’s brightness without using the integrated rheostat too much or indeed using too much battery power. The recoil of a Remington 870 12 GA is very well-handled by the Truglo, which says a lot about how useful it is, but why exactly is this a budget sight then? Well, there is only one real reason why this is a budget scope that costs less than $70. You can’t really use it on its own unless you’re limited to only a few (a couple actually) firearms in your arsenal. You almost always have to co-witness it with the suggested A2 peep sight, so that’s perhaps why it doesn’t cost too much and weighs so little. You’ll also need a carry handle if you want to fit it onto an AR-15, so it may not be the absolute best sight for true precision shooting. Not the best sight for true precision shooting – you could perhaps spend a little bit more for the Digital Switch sight featured in our Sightmark Ultra Shot review. Check out our list of the best red dot sights to make price and feature comparisons. If there is anything you can take away from this Truglo Red Dot review and run with it it’s that while this is indeed a budget red-dot sight with a range of really good features for its price, it sort of ceases to be a budget sight when you realize that you almost always have to co-witness it with an A2 type site.